Christopher Paul Carey (co-author of THE SONG OF KWASIN with Philip José Farmer) discusses Farmer’s Ancient Opar Series at the 2016 Dum-Dum in Morris, IL, hosted by the Burroughs Bibliophiles. A note from Christopher Paul Carey: I would like to correct two minor errors I made in my Dum-Dum talk. One, the Ancient Opar series is set 12,000 years ago (not 10,000 years ago). Two, Frank Brueckel’s last name is properly pronounced “Breckel” (not “Broy-kel”). I can only blame stage fright and lack of sleep for these mistakes, as I was well aware at the time of both facts. 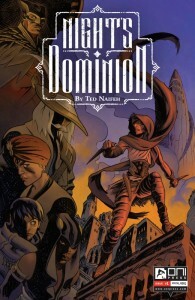 Night’s Dominion wasn’t on my radar until a post by a fellow member of the Comic Book Art of Conan the Barbarian Facebook group posted an interview with the creator, Ted Naifeh. The elevator pitch seemed to be superheroes operating in a fantasy world. I thought the concept sounded fairly interesting and the artwork showcased in the interview really sold me on giving it a try. I made sure to add the book to my pull list at my local comic shop. The release of the first issue kind of snuck up on me, but I was pleasantly surprised to see that it came out this week. As far as first issues go, this one was pretty solid. We’re introduced to the cast of characters as well as the setting, the medieval-styled city of Umber. I get the impression Umber is a sister city of Fritz Leiber’s Lankhmar and Sanctuary, the primary setting of the Thieves’ World shared universe series. 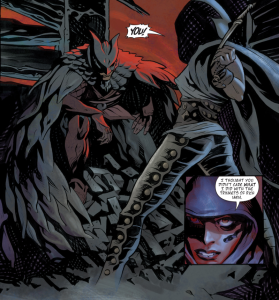 The first issue does a good job of blending both the fantasy genre and super hero genre (or, at least so far, the urban vigilante sub-genre) together. It introduces us to the main characters via the “adventuring party meets at a tavern or inn” mechanism sometimes used in fantasy role-playing games. While not the most original way to do it, it’s definitely the most convenient way to bring a large, diverse group of characters together quickly. Members of the party include its leader, a white-haired bard referred to as Maestro, an unnamed “magus” whose specialty is implied to be illusions and parlor tricks, a unnamed young cleric, who is an acolyte of something referred to as the Old Faith, an unnamed assassin from an organization known as the House of the Asps, and the barmaid, Emerane, who is secretly the best thief in the city, moonlighting under the alter ego of the Night. The Maestro’s plan is for the group to rob the Tower of Uhlume, a temple where the titular King of Oblivion is worshiped. They plan to get to the treasure stores in the tower’s subbasement via a concealed shaft. Emerane declines the job stating she doesn’t work with amateurs. She leaves the tavern after a brawl erupts, but her and the assassin have a brief martial encounter on her way home and a conversation. 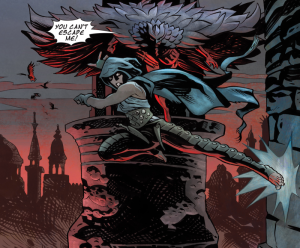 But Emerane departs soundlessly, leaving the assassin alone. Later in the guise of the Night, Emerane returns a necklace to her stash of stolen loot in the belfry of a chapel and encounters the Fury. He’s the armored Batman-looking figure seen in the preview artwork. They have a brief tussle and conversation before Emerane eludes him. I get a definite Batman and Catwoman vibe from these two. It’s not clear if the Fury is a vigilante or works in some capacity with the government or city watch, but I look forward to learning more about him in future issues. The next scene shows the cleric returning to his chapel, this is the same one which the Night used as a stash for her loot. City guards are confiscating the hoard as the head priest is crying on the steps. It was mentioned earlier that the Old Faith was hard up for money and it was goons looking to collect from the young cleric that were the catalysts of the tavern brawl. The final scene shows Emerane, as the Night, meeting the group of adventurers at the arranged meeting spot and agreeing to join in the heist. 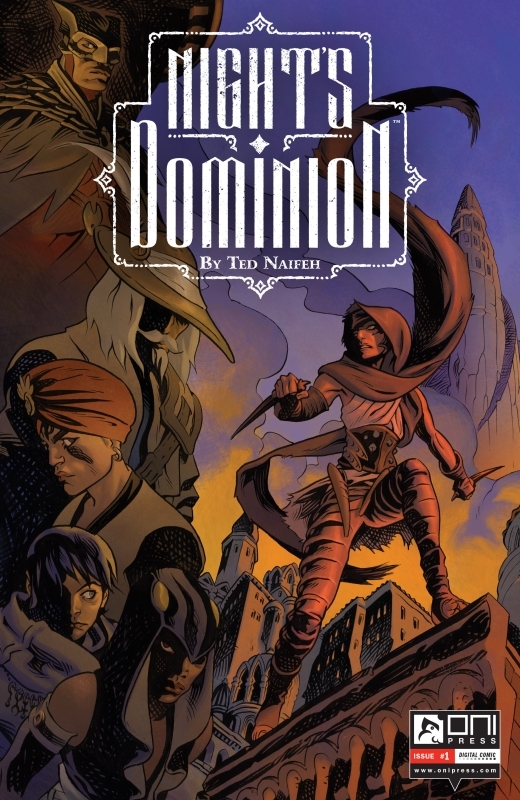 This was my first time reading a comic created by Ted Naifeh, but I have to admit, I like what I see. I enjoy the way he renders his characters and his panel to panel storytelling skills shown he’s been illustrating sequential art for some time. The artwork and storytelling get high marks from me. From a writing perspective, I enjoyed how there wasn’t a lot of info dumping, Naifeh does a good job of layering information subtlety through the course of the story. Such as facts about the politics of Umber, including its royal family. There’s plenty yet to be revealed about the city of Umber and the main cast of characters, though. This first issue has me intrigued, and I’m on board for at least the first six issues. I wish there were more fantasy comics like this on the stands and I want to do my part in supporting quality comics like this when they do pop up. Last year I was lucky to obtain an advanced reader copy of Hadon, King of Opar by Christopher Paul Carey before its release at PulpFest 2015. PulpFest 2016 is just around the corner and once again Meteor House provided Pulp Crazy with an advanced reader copy of the latest novella in Philip Jose Farmer’s Khokarsa (Ancient Opar) series, Blood of Ancient Opar by Christopher Paul Carey. Blood of Ancient Opar picks up immediately following the massive cliffhanger of Hadon, King of Opar. Hadon and his allies have triumphed over the forces of the Mikawaru pirates who had invaded Opar in Hadon, King of Opar (with the Priests of Resu and the Oracle of Kho assisting the raiders), but Hadon’s troubles are far from over. His daughter La reveals an ancient prophecy to Hadon and the two of them spend the rest of the novella trying to make sense of it and use it to their advantage against an emerging threat. Blood of Ancient Opar is a fast-paced adventure that once again has the reader side-by-side with Hadon throughout the course of the story. This is one of those tales that is tough to review, as I don’t want to spoil some major events that occur in the book, but I can discuss some portions. During the course of the book, Hadon finds himself in the valley adjoining Opar, the Valley of the Royals. Here, Hadon visits the Palace of Queens, which readers of Tarzan and the Golden Lion will likely find very familiar. The wonderful cover painting by Bob Eggleton depicts this event. The chapters set at the royal retreat were some of my favorites, as it was fun to visit an all-new location in Ancient Opar alongside Hadon. On a grimmer note, needless to say, before the events of Hadon, King of Opar, the queendom was already facing hard times. As Blood of Ancient Opar begins, the city is in an even worse situation. Hadon and La really have their work cut out for them if they hope to get Opar back on track. Using Farmer’s notes, Carey skillfully executes the kind of fantasy adventure tale you just don’t see much of anymore. His contributions to the Khokarsa/Ancient Opar series feel right at home sitting beside Farmer’s original Ancient Opar books on my bookshelf and I feel fortunate to see the series continue in such great hands. Blood of Ancient Opar is everything I hoped it would be. This is a tale of heroic fantasy skillfully brought to life through the pen and mind of a writer intimately familiar with the source material. Blood of Ancient Opar hearkens back to classic sword and sorcery adventures of the past while displaying a mastery of modern fiction writing. 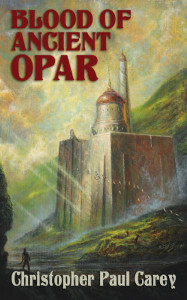 One thing thing is for sure, readers familiar with Opar will never look at the lost city the same way again. Blood of Ancient Opar will be debut July 21st at PulpFest 2016 / FarmerCon XI in Columbus, Ohio. The novella is available for preorder in both softcover and hardcover formats at http://meteorhousepress.com/blood-of-ancient-opar/ . It’s highly recommend you preorder now if you want to guarantee a copy. Meteor House is also offering the remaining copies of Hadon, King of Opar for sale as well. The two novellas can be purchased together while supplies last. In honor of Robert E. Howard’s 110th Anniversary (Howard was born on January 22, 1906) I will be discussing “The Man-Eaters of Zamboula” starring Conan the Cimmerian. It was originally published in the November 1935 issue of Weird Tales as “Shadows in Zamboula.” It is currently available in The Conquering Sword of Conan collection from Del Rey. It tells of Conan’s chaotic stay in the desert city of Zamboula. In this week’s episode, in honor of Clark Ashton Smith’s birthday (January 13, 1893), I’ll be discussing “The Dark Eidolon.” It first appeared in the January 1935 issue of Weird Tales, and is probably the Zothique story that carries the most name recognition. It tells of Namirrha, a powerful sorcerer who returns to his home city in order to exact revenge on its ruler for a boyhood transgression. In this week’s episode I’ll be discussing Swords and Deviltry (Fafhrd and the Gray Mouser Book 1) by Fritz Leiber. It’s a fantastic collection of three high quality, award nominated sword and sorcery novellas. The most prominent being Ill Met in Lankhmar, which won the 1971 Hugo and 1971 Nebula awards for Best Novella. It’s a sword and sorcery classic. In this week’s episode I’ll be discussing “The Doom that Came to Sarnath” by H. P. Lovecraft. It’s a fantasy short story that made its first pulp magazine appearance in the pages of the March-April 1935 issue of Marvel Tales of Science and Fantasy. It would later appear in the June 1938 issue of Weird Tales. It was first published in the June 1920 issue of the Scot, an amateur journal. The story chronicles the rise and fall of the city of Sarnath, which is located on the shore of a vast still lake in the land of Mnar. The story takes place roughly from 9,081 B. C. to 8,081 B. C. in a lost age akin to Robert E. Howard’s Hyborian Age and Clark Ashton Smith’s Hyperborea. 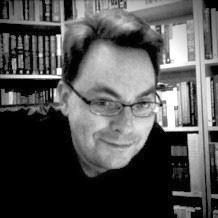 Pulp Crazy got a chance to sit down with author Christopher Paul Carey to discuss the upcoming standalone release of The Song of Kwasin, the conclusion to Philip José Farmer’s original Khokarsa/Ancient Opar trilogy. This is the first time the novel will be available as a standalone edition; it’s the perfect time to pick this up if you’ve been wondering what happens after Hadon of Ancient Opar and Flight to Opar. Chris gives us the lay of the land in terms of the Khokarsa/Ancient Opar series and discusses the history of The Song of Kwasin, providing some insight into the process of working with Philip José Farmer in completing it. The Song of Kwasin is the sequel to Philip José Farmer’s Hadon of Ancient Opar (1974) and Flight to Opar (1976), and yet the novel has a different main character. How does The Song of Kwasin continue the storyline of those books? The first novel of the series stars Hadon of Opar and his wayward adventures after the power-hungry King Minruth cheats him out of winning the throne of Khokarsa by sending him on a fool’s errand into the Wild Lands beyond the empire. Here Hadon runs across his giant, half-mad cousin Kwasin, who has been exiled for his crimes against a priestess of the Great Mother Goddess Kho. After succeeding in his quest, Hadon returns back to the capital with Kwasin and their companions, only to find the empire torn asunder by a civil war. We last see Kwasin in the prow of a boat, swinging his mighty ax of meteoritic iron against Minruth’s overwhelming forces while Hadon and the others escape. In the second novel of the series, a prophecy of the oracle hurls Hadon back to his home city of Opar, but we hear nothing of Kwasin except that he has somehow become king of Dythbeth, a city on the island of Khokarsa that’s at war with Minruth and his armies. The Song of Kwasin picks up right after the events of Hadon of Ancient Opar, and is the story of how Kwasin tries to clear his name and take the fight to Minruth against insurmountable odds. So The Song of Kwasin actually takes place concurrently with many of the events in Flight to Opar. How did you come to coauthor The Song of Kwasin with Philip José Farmer? I was serving as coeditor of Farmerphile, a periodical dedicated to publishing Philip José Farmer’s rare and previously unpublished writing, when the original outline and partial manuscript of The Song of Kwasin was found in Phil’s files in 2005. When Farmerphile’s publisher, Michael Croteau, sent me photocopies of the outline and manuscript so we could see whether we wanted to use them in the magazine, I could hardly believe what I was seeing—Kwasin’s epic tale and the entire arc of the war against King Minruth spelled out in full. I knew immediately that the story had to be written, so I wrote up a pitch and sent it to Phil, who at that time had retired from writing. Much to my surprise, he accepted it. I think the fact that we both had a mutual love of anthropology and the works of Edgar Rice Burroughs and H. Rider Haggard—all inspirations for the series—had a lot to do with his decision. I also believe he was excited by the idea of seeing the main arc of the trilogy finally completed. He’d been considering completing the third volume of the series as late as 1999, but he retired shortly after that and then had a number of health setbacks in the years that followed. In 2005, I was in the middle of a graduate study program in writing. Phil and his wife Bette both agreed that I should complete my studies before I began writing the novel, which I did. Though I completed The Song of Kwasin in early 2008, novel wasn’t published until 2012 due to other Farmer projects in the pipes with the publisher. But Phil, who passed in February 2009, was able to see the completed novel, which Bette read aloud to him. And for that I’m glad. I think it meant a lot to Phil to know the novel he’d long planned was at last finished. What did Philip José Farmer think of the completed novel? Bette Farmer told me it brought a big smile to Phil’s face to hear Kwasin’s adventures, and that they both really enjoyed it. Did Mr. Farmer give you any direction while you were working on the novel? Yes. Early on he told me how he wanted the novel to end. I was able to ask him some questions about alternative courses he’d left open in the outline, and he told me to disregard those and how he wanted the novel to wrap up now that it was to be positioned as the climax of a trilogy. That was all extremely helpful. Later on he was too ill to give me much input, but by then I was already writing the novel and we’d worked out where the story was headed. I’ll always be grateful to Phil for his generosity and encouragement. 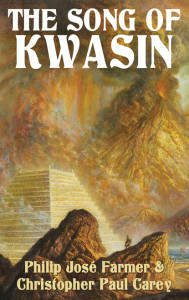 The Song of Kwasin was previously available only as part of an omnibus. Could you discuss the bonus materials that will appear in the new standalone edition of The Song of Kwasin, which is due out from Meteor House in December 2015? First up, there’s a stellar introduction by Paul Di Filippo. That’s a huge honor and treat for me because I admire his writing so much. Then I’ve written a preface to the new edition, giving a lot of background on how the book came to be written. Following the novel comes “Kwasin and the Bear God,” a 20,000-word novella based on Philip José Farmer’s outline that relates a lost adventure set between the first two chapters of The Song of Kwasin. The new edition also includes a “Guide to Khokarsa,” rare articles by Farmer, reproductions of some of his notes on the series, the original and alternate outlines to The Song of Kwasin, and previously unpublished correspondence by Farmer with Frank J. Brueckel and John Harwood, authors of “Heritage of the Flaming God,” the monumental essay that inspired the Khokarsa series. You mentioned that The Song of Kwasin was the climax of a trilogy. Has the series been completed or is there more coming? If you read The Song of Kwasin, you’ll understand why I say it’s the end of the main story arc of a trilogy. But there’s still a lot left to tell of the saga of Khokarsa. At one time, Phil said he planned to write twelve books in the series. Using Phil’s notes on where the story was headed, I wrote Hadon, King of Opar, which should be considered the fourth volume in the Khokarsa series. Its sequel, Blood of Ancient Opar, is slated to be published in 2016. After that, I have plans for a trilogy about Hadon’s son, Kohr. I’m also toying with the idea of someday returning to the character Lupoeth, the priestess-heroine of Exiles of Kho, my novella about the origin of the city of Opar. But we’ll see. Right now I’m committed to writing Blood of Ancient Opar and the new trilogy about Kohr. Only Kho and the golden tablets from the lost cities of Opar and Kôr know what happens after that! The Song of Kwasin releases in December 2015 and can be preordered here. Christopher Paul Carey is the coauthor with Philip José Farmer of The Song of Kwasin, and the author of Exiles of Kho and Hadon, King of Opar. His short fiction may be found in anthologies such as Ghost in the Cogs, Tales of the Shadowmen, The Worlds of Philip José Farmer, Tales of the Wold Newton Universe, and The Avenger: The Justice, Inc. Files. He is a senior editor at Paizo on the award-winning Pathfinder Roleplaying Game, and has edited numerous collections, anthologies, and novels. He holds a master’s degree in Writing Popular Fiction from Seton Hill University. Visit him online at http://cpcarey.com.